with information which you may not find in regular Travel Booklets. A firm friendship and a mutual philosophy of life brought the two men together. Thanks to their bond of friendship, which lasted for 26 years, the village Buitrago de Lozoya today has their own Picasso museum. The story commence in the early thirties. Pablo Picasso and Eugenio Arias emigrated to France in the beginning of the Franco-period and got to know each other one day when Picasso needed a haircut. At that time the painter lived in Vallauris, in the villa "La Gauloise", together with his wife Francoise Gilot, the mother of Claude and Paloma. The two friends shared everyday life in the way men do; they played cards, visited bars and bullfights, but also their families became close friends. Picasso showed his appreciation by presenting different works of art to his friend, from signed restaurant menus to decorated barber-cases. In the late seventies Eugino Arias returned more frequently to his native village, Buitrago de Lozoya, outside Madrid, during the summers. There, he decided to donate his complete Picasso-collection to the village, under the condition that it shouldn't be used for commercial purposes. Consequently, there is no entrance-fee to the small museum, situated in the basement of the Municipal Hall. - You should not make a profit of gifts you receive from a friend, but a person who plants a tree does, on the other hand, something good for the entire mankind, says the Barber. - Picasso and I helped and supported each other during all the years. We protected one another, and emotionally and ethically, we shared many norms and values, especially the ethics of work. Pablo Picasso felt that a person who lived without working was "a social thief" and the two friends shared the view that only a person who work and provide something to humanity is loyal. - None of us manifested our rights outwards, but we realized that there are no rights without obligations in life. Pablo always stated that work was a necessity and not a human right. - Picasso lived for creating, giving, for friendship, and the respect for freedom and peace, says Eugenio Arias. Eugenio's and Pablo's strong friendship lasted until Picasso's death. - I didn't however have any contact with the artistic or intellectual world during all those years. Probably our similar characters united us. - It's not until I finish cutting someone's hair I notice if I have made a mistake, and then it's already too late, grumbled the barber one day before Picasso. The painter immediately recognized himself and said - You are also an artist and an apprentice, just like me. 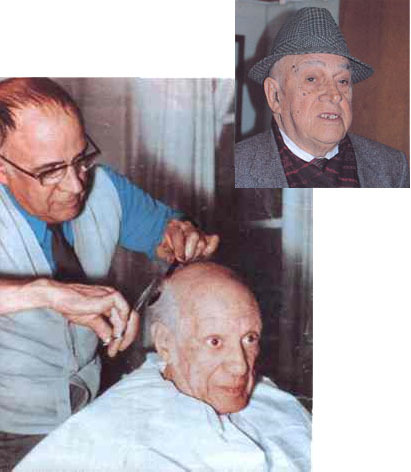 Smaller photo: The Barber Eugenio Arias, 1997. Larger photo: In the good old times. Picasso is having his hair cut by his friend, the barber. (Thanks to the Spanish Ministry of Culture for letting me publish the photo). Eugenio Arias died at the age of 98 in his home at Vallauris, France in the end of April 2008. Read more about him in the Spanish newspaper El País.